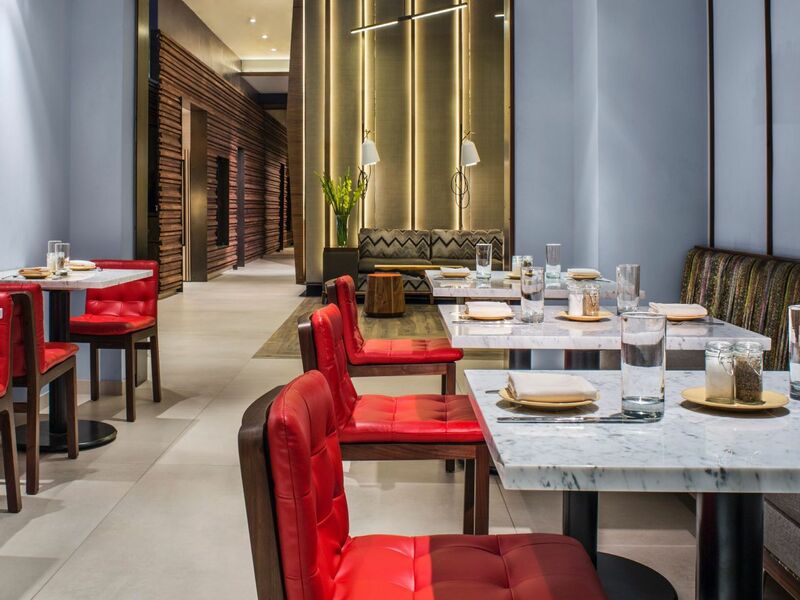 Enjoy an energetic food and social scene without ever leaving our Midtown Manhattan hotel. Hyatt Herald Square New York offers multiple dining options for our guests including The Den, our lifestyle and dining lounge, with the Library Bar. 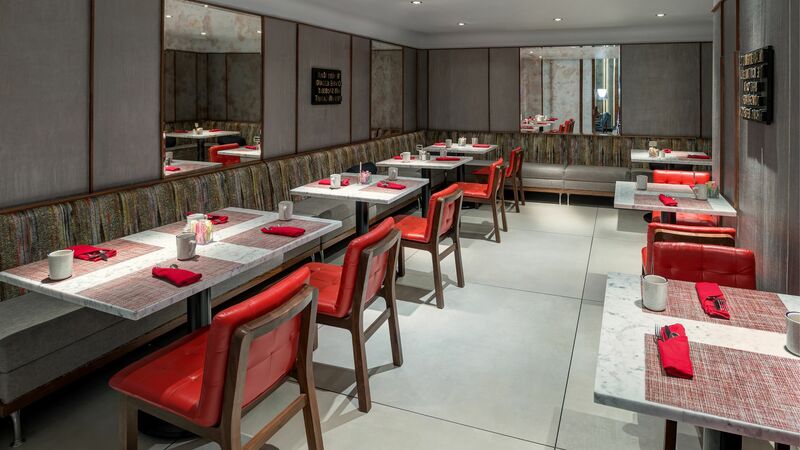 With its open concept design The Den serves a variety of New American cuisine made with fresh, seasonal ingredients. Unwind in the evening at our Library Bar where happy hour specials are served every day or enjoy the city lights at our rooftop lounge in Manhattan, Up on 20. Experience incredible skyline views at Up on 20, our rooftop bar in Manhattan. Set against an impressive backdrop of the Empire State Building and Freedom Tower, Up on 20 offers cozy seating and pub-style tables to mix and mingle. Share contemporary small plates and tapas, made with fresh, seasonal ingredients. Our mixologists expertly shake and serve signature-infused vodkas in addition to a wide selection of premium beers, wines and spirits. 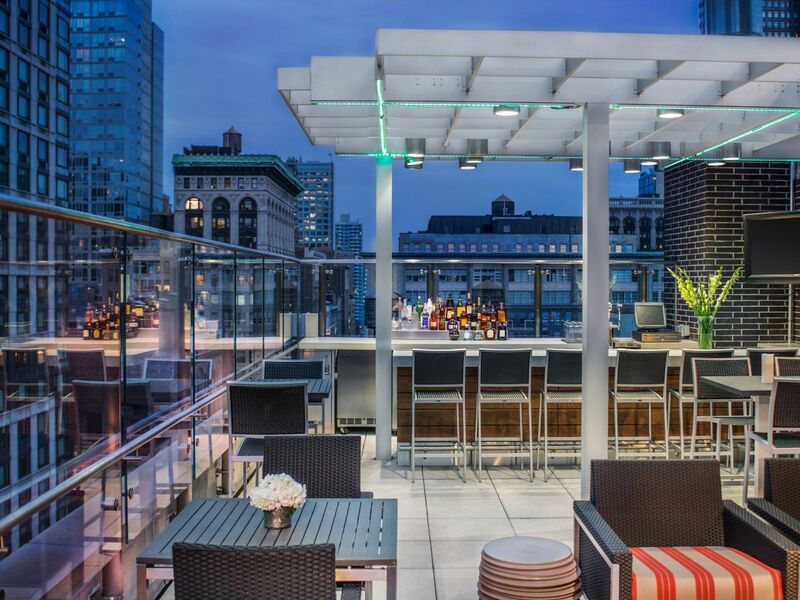 One of the most unique rooftop lounges in NYC, Up on 20 brings comfortable modern design to refreshing outdoor living. Sip on a frozen daiquiri to cool off in the summer, or warm up with a classic Manhattan in the fall. Our intimate Manhattan Herald Square restaurant The Den and Lobby Library Bar features a causal bistro menu. Emphasizing on simple, market fresh ingredients, the menu offers seasonal entrée’s as well as Small Bites, making The Den & Library Bar an ideal option for meals, group sharing, or a quick bite on the go. The Library bar features a dedicated cocktail menu with seasonally inspired drinks and creatively infused spirits, some of which will be infused in-house, with seasonal fruits and flavors such as cherry and vanilla bean. For those looking beyond the cocktail menu, a variety of local and international beers and wines as well as natural sodas and mocktinis are available.